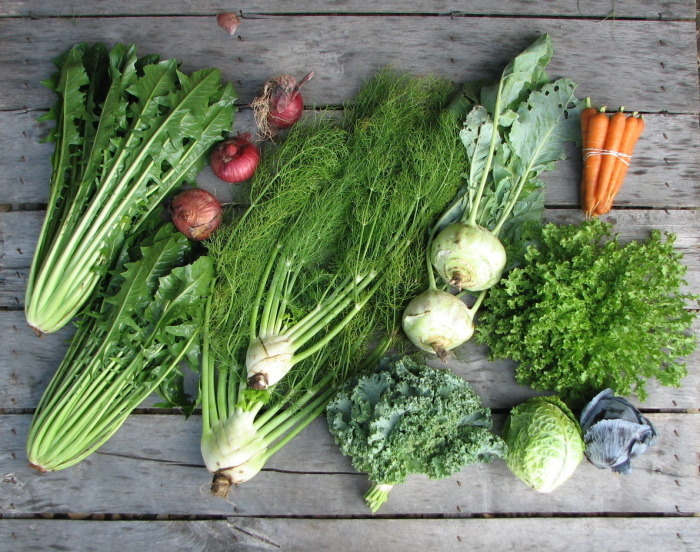 Welcome to your FIRST share of the Summer CSA Season! Thank you guys so much for partnering with us for this growing season. We have loads of great crops in store for you over the next couple of months. We have a few wonderful strongholds from the spring garden for you to enjoy, and some of the more traditional summer crops are just beginning to come on. Each week come back to the blog to see that week’s share notes and learn all about the contents of your share. Zucchini—Each share received a bit of zucchini this week. Small zucchinis will be great for sautéing, roasting, or grilling. Larger zucchinis will be perfect as zucchini bread, stuffed zucchini boats, or for pickling. Squash—Our very first squash harvest of the season! When the plants put out their first fruits, some of them are tender and amazing, and some are a bit firmer, so a few of you may have slightly over-mature squash great for a squash casserole or to use in zucchini muffins moreso than fresh sautéing. Expect the tenderness to improve after this first picking, and to wane again in several weeks when the plants reach the end of their life cycle. We plant a few rows in succession in hopes to have this crop all summer long as it’s one that is very susceptible to pests and disease when growing organically like we do here at RMF. Surprise blueberries!—We partner with our friends John and Anita Sattler at Winona Orchards to bring you these delectable treasures. They strive for sustainability in their fruit production, but they do use conventional sprays to control pests when needed. A good rinsing to remove any residue will do the trick for this special treat. Beets—Large shares received a large bunch, and small shares, a small bunch of our chioggia beet, the kind that look like a bullseye when you slice across them. They are beautiful! The greens are not pretty enough for eating this late into beet season, so just chop them off and discard. If you need beet suggestions, I recommend our wonderful Beet spread (we could eat this every day!) or our roasted salad. Carrots—almost all of our shares received a bunch of our unique Atomic Red carrots and a few shares received our excellent crips and crunchy orange carrots. Dandelion Greens—Each share received a head or two of dandelion greens, our hearty summer greens that are absolute a super food! Did you know that dandelion is considered a medicinal herb? This green is super flavorful and on the bitter end of the flavor spectrum. It will be great with a little sour and a little sweet to cut the bitter: how about fresh lemon juice, shaved fennel bulb and blueberries? This morning we’re enjoying a fantastic dandelion greens with eggs recipe we often enjoy this time of year with sweetly caramelized onions and briny feta. Fennel—All shares received a couple bulbs of fresh, fragrant fennel. I received a pro-tip from one of ourfarmers market customer this weekend to toss the bulbs into a crockpot with a beef roast and it was so fantastic. We have a few great fennel recipes over on the kitchen blog as well. The fronds are great with grilled fish or chicken. Onions will prefer to stay at room temp. 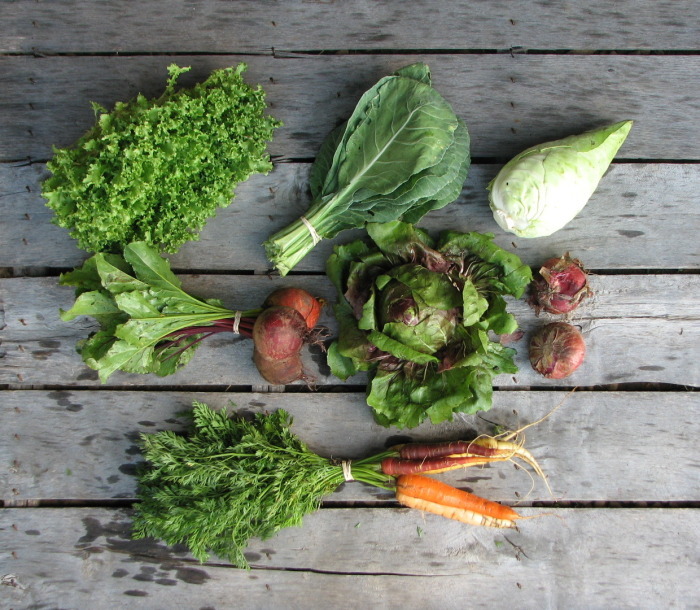 Root crops should be severed from their tops to keep the roots from getting rubbery. They can then also be sealed up in the fridge to stay crisp and the tops can be stored like other greens. Squash and zucchini can stay out at room temperature for a couple of days, but if you can’t eat them soon, they’ll store several days longer in the fridge. 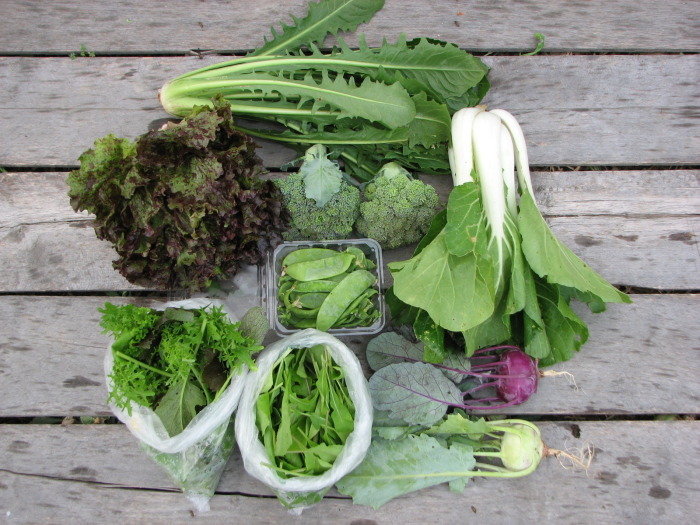 The dandelion greens, blueberries, and fennel also prefer the fridge. Everything will need a gentle washing before cooking, but leave the dirt on until you’re ready to use them to prevent faster spoilage. 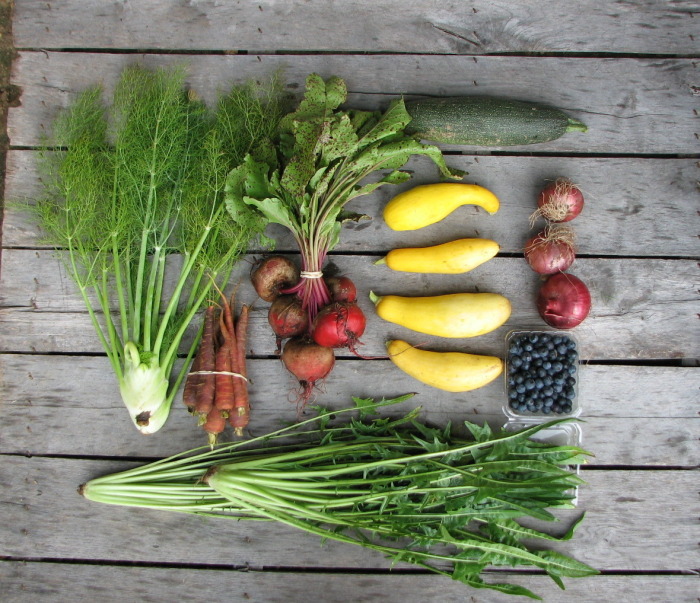 Large Share: (left to right) fennel, carrot, beet, zucchini and squash, red onion, blueberries, and dandelion greens. 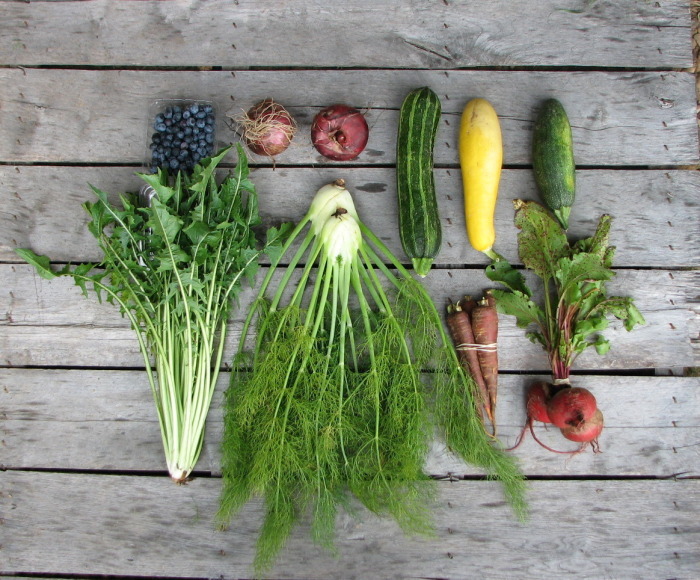 Small share: (top row) blueberries, red onion, zucchini and squash, (bottom row) dandelion greens, fennel, carrot, and beet.